Oh em gee these little beauties have stolen my heart. I don’t buy them a often but when I do I am reminded just how lovely they are. The first time I had ever tried a pomegranate I believe I was maybe 15, and at a friend’s house – because the picky eaters in my household did not eat such fruits – and we had them with breakfast. I was definitely a little skeptical at first, but then I took my first bite of the poppy/crunchy/sweet seed and understood what all the fuss was about. So delicious! And not only do pomegranates taste amazing they are pretty too. with Candied Pecans and Orange Poppy Seed Dressing. 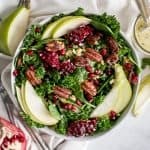 This is one of those classic holiday salads you will want to put on your party menus for the end of the year. I’m always the advocate for making sure there is a salad at holiday meals. Not because we shouldn’t be enjoying ourselves with the other (often rich) dishes being passed around, but just because it’s nice to have a lighter option and get in those greens! I am so over restricting and micromanaging all of the food that goes into my body, I just still like enjoying healthier options WITH the more indulgent, “good-for-the-soul” kind of foods. And I’m *hoping* maybe that’s where your head is at too. Cutting a pomegranate is really simple. First slice off the ends, then make shallow, vertical slits going from the top to the bottom. Next you should be able to pry open the pomegranate and begin removing the seeds from the membrane. Simply Recipes has a great step-by-step visual for you here. I used spinach and curly kale but feel free to use your favorites. Spring mix would also work here. SIDE NOTE: If using kale, it’s best to massage it with oil before making the salad. Just trust me on this! Many people dislike kale because it hasn’t been properly prepared, i.e. dry and bitter. Rubbing the leaves with oil softens them and makes them taste much better! Plus using it with a blend of greens usually makes it more tolerable for people. 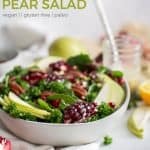 This pear salad recipe is gluten-free, vegan, paleo and can be easily made Whole30® compliant as well (see notes below in the recipe page). 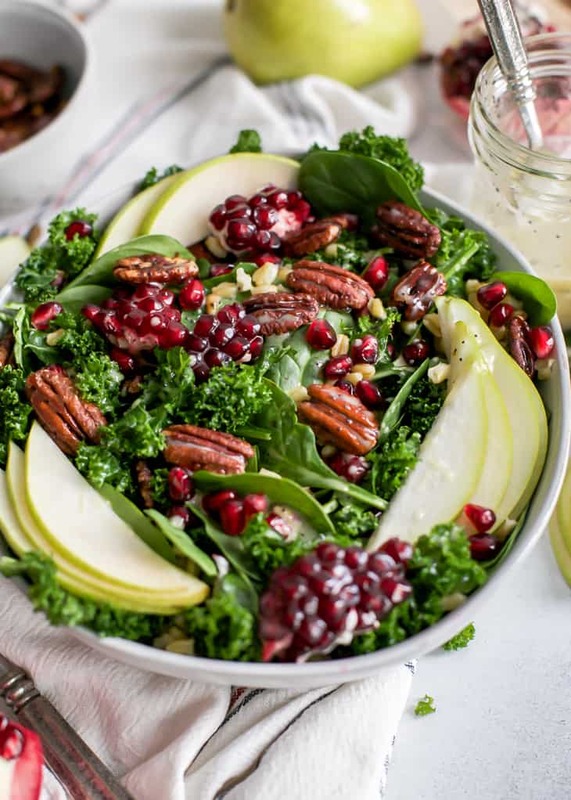 Not to mention the perfect festive salad for holiday parties. 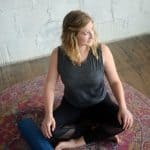 Let me know if you try! 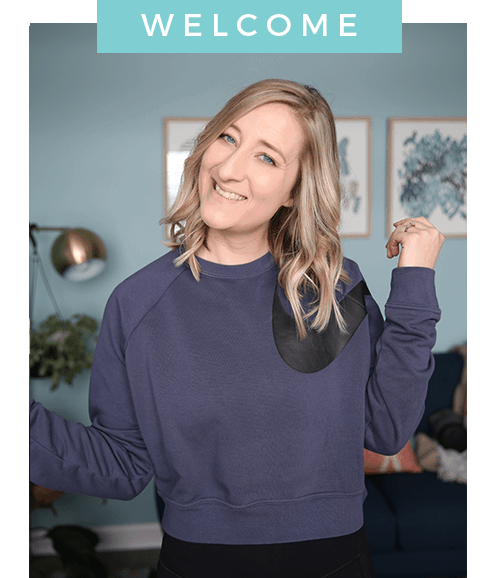 I love hearing from you – leave a comment and review on the blog to help others find the recipe too. 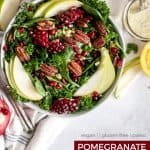 Pomegranate Pear Salad with candied pecans and orange poppyseed dressing – the perfect holiday salad! Vegan, gluten-free, and paleo. 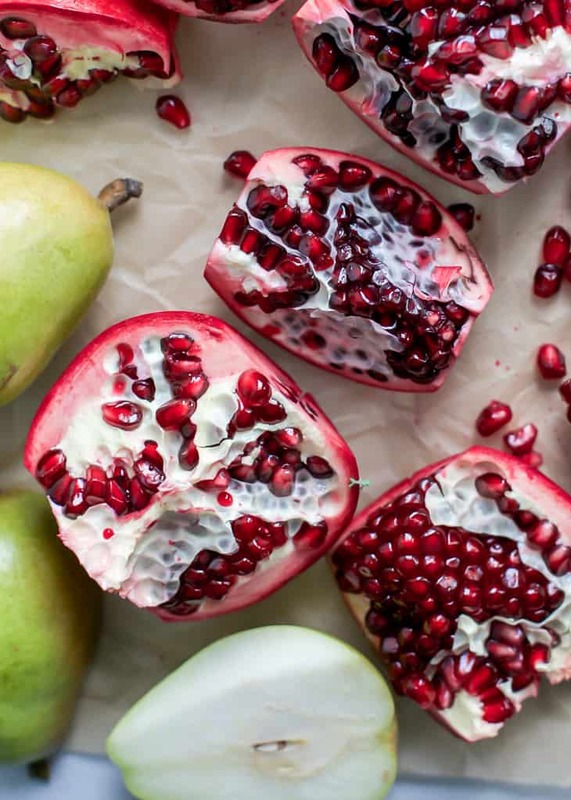 Prepare fruit: thinly slice pears and de seed pomegranates. Prepare salad greens: roughly chop kale and massage with oiled hands. Cut into smaller pieces if desired and mix with spinach greens. 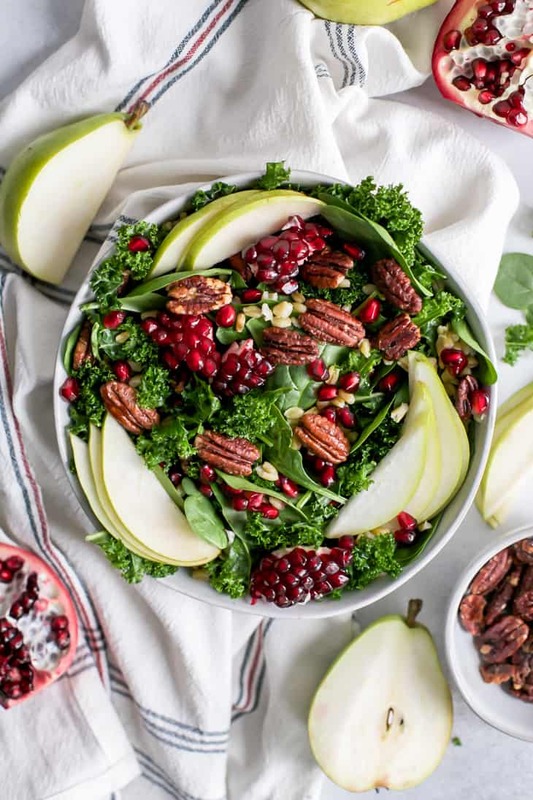 Assemble salad: Place greens and grains in bowl, then add pomegranate seeds and candied walnuts; toss together and sliced pears. 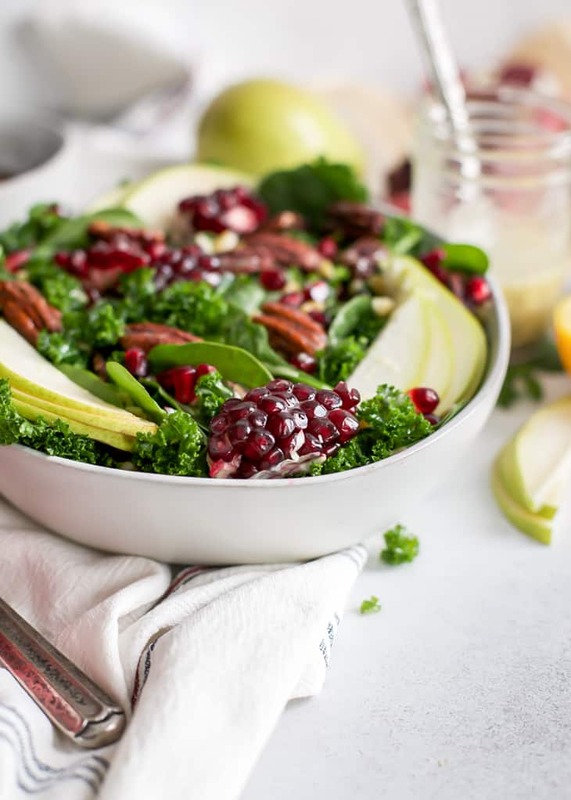 Make the dressing: Whisk all salad ingredients in bowl or combine in small blender. Serve with salad or drizzle on about 1/4 cup and toss to lightly coat. to make candied walnuts: turn oven to 325ºF and line rimmed baking sheet. 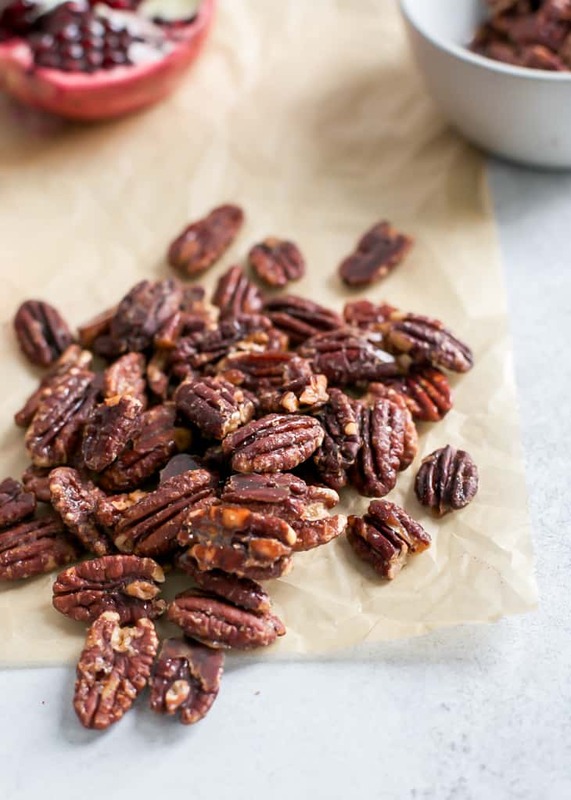 Toss together 1 cup walnuts with 2 tbsp maple syrup, sprinkle with cinnamon and a little salt. Spread in even layer and cook for about 10-15 minutes, stirring every 3-4 minutes. Allow walnuts to cool on baking sheet before storing in container. 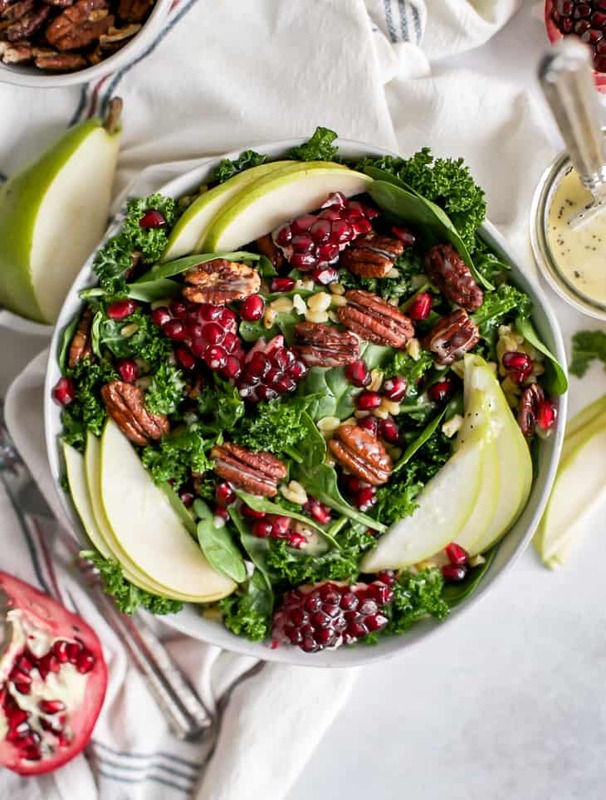 I am SUCH a sucker for kale salads with pomegranate seeds, a tarty dressing, crunchy nuts, and a sense of freshness, acidity, sweetness, and a hint of saltiness or spice. This is absolutely perfect! I’d probably substitute the honey for monkfruit sweetened maple syrup or even an extra squeeze of orange juice. Otherwise, it’d be PERFECT for me!